Next post: Stencil Giveaway Winner! 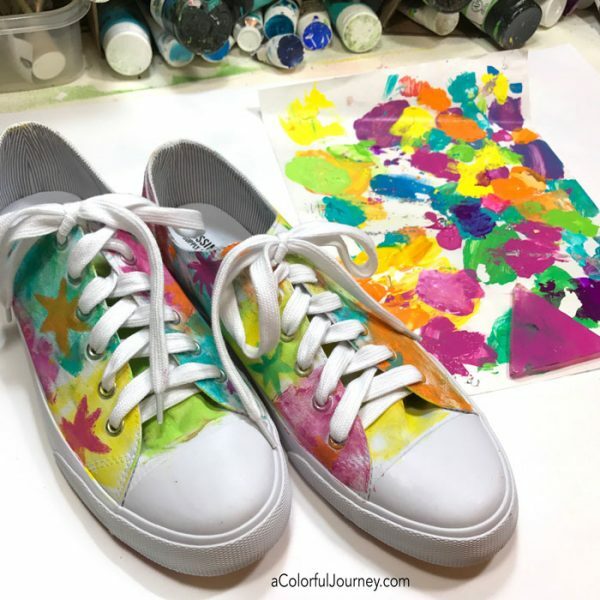 Paint Couture…fun to make and fun to wear! Turns out finding a rainbow colored pair of shoes isn’t as easy as you might think so I decided to make some rainbow shoes! 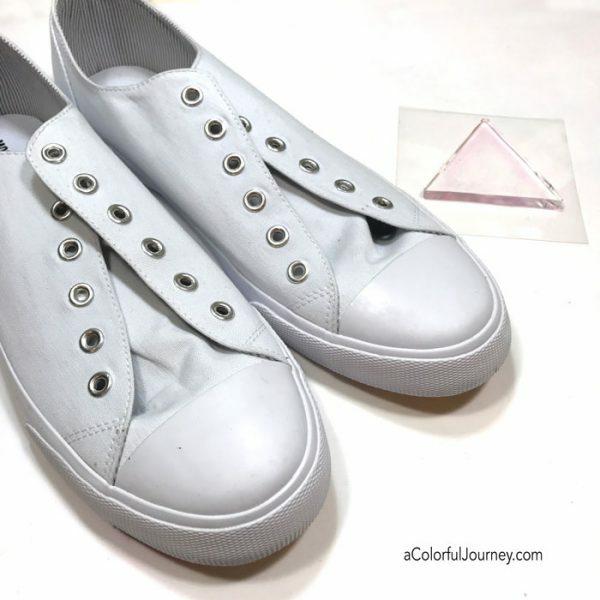 Clearly, I did not cobble them myself but simply painted a cheap pair of canvas sneakers. 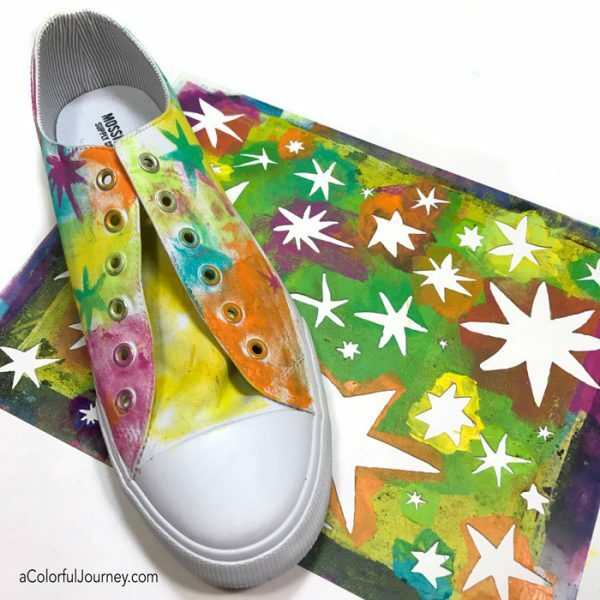 Even though you don’t see triangles all over the shoes, the triangle petite plate from Gel Press was used for the entire shoe, including stenciling the stars using the new Stars Inspired by Matisse stencil. You can see the whole process in the video including how I managed to keep the white rubber so white (hint baby wipes). 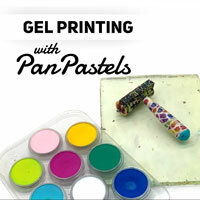 Watch Gel printing and stenciling sneakers on YouTube. Want to win the stencils used in this video? One lucky reader will win all 7 of my new stencils. Leave a comment on this blog post for a chance to win. Want more chances? Leave a comment on each of the giveaway posts (Wednesday’s, Thursdays, Saturday’s and today’s posts!) See all the details at the end of this post. 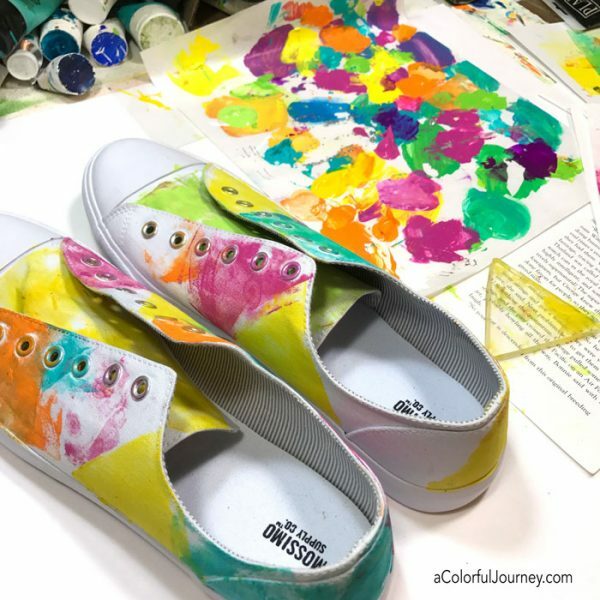 What types of paint do I use to paint shoes? Any acrylic paints that I had in arm’s reach. After all, any time I spill paint on my clothes it is hard to get it out. I could have used fabric paints but these are cheap shoes that probably couldn’t stand going through the washing machine too much anyway, so it being washable over the long haul isn’t an issue to me. 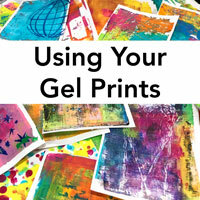 Why use a gel plate instead of a brush to apply the paint? The slight variations and color minglings from a dirty plate are tough for me to duplicate with a paint brush. The stars from my Stars Inspired by Matisse stencil were added using the gel plate. Why that instead of a cosmetic sponge? The plate was right next to me and it also allowed for the paint minglings of the dirty plate to happen on the stars too. Paint Couture, not something you’ll see at Fashion Week in NYC but one of the side benefits of wearing shoes like this is that every time you wear them, you are reminded of the fun that was had making them! Want to win the stencils used in this post? 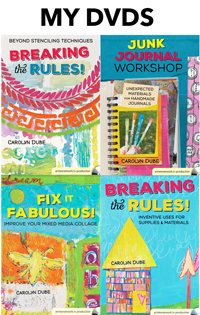 One lucky reader will win all 7 of my new stencils. Leave a comment on this blog post for a chance to win. Want more chances? Leave a comment on each of the giveaway posts (Wednesday’s, Thursdays, Saturday’s and today’s posts!) See all the details at the end of this post. I want everyone to have a chance to win, so International folks are eligible too! 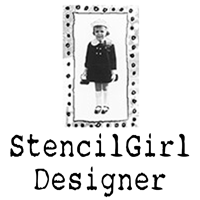 Of course, if you win and you’ve already ordered any of the new stencils, you can pick any of my other 50+ stencils at StencilGirl. Giveaway ends on Jan. 31st at 11:59 pm. EST. Winner will be announced the following day on the blog. Want more chances to win? Bonus entries for sharing any this post on Facebook, or Pinterest, or Instagram! How will I know you did it? Just come back and leave a comment telling me where you shared it. Random.org will be picking a winner from the 4 blog posts on Jan. 31st at 11:59 pm. EST. Winner will be announced on the blog the next day. I love this idea! You definitely made a FUN pair of shoes! Bravo! Not haute couture?!?! I bet Carrie Bradshaw would love to own a pair of these! I have to make a pair for myself! Yum! Great technique with your new stencil. I love the uniqueness of your sneakers! I should do that to one of my white pairs…of course I would have to wear them to work-I would definitely cause a stir. Fantastic look! I need to try this on some of my more orthopedic shoes which are just not the look I want to sport. What FUN shoes!!! Great giveaway, thanks! This is the most fun!!! We have a new granddaughter arriving in April. I could fix up her shoes!!! I want to try this on an old pair of jeans! They’re already paint splotched, so no worries!?? Off to find a pair of white tennies — I can’t wait to have a go at it. A bathroom, shoes, what’s next? Love all these projects! Something I have been wanting to try – thanks so much for the information. Thanks for a chance to win. What a neat idea! 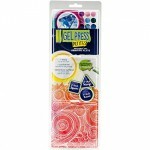 I really like the gelli plate idea. Your stencils look great on the sneaker. 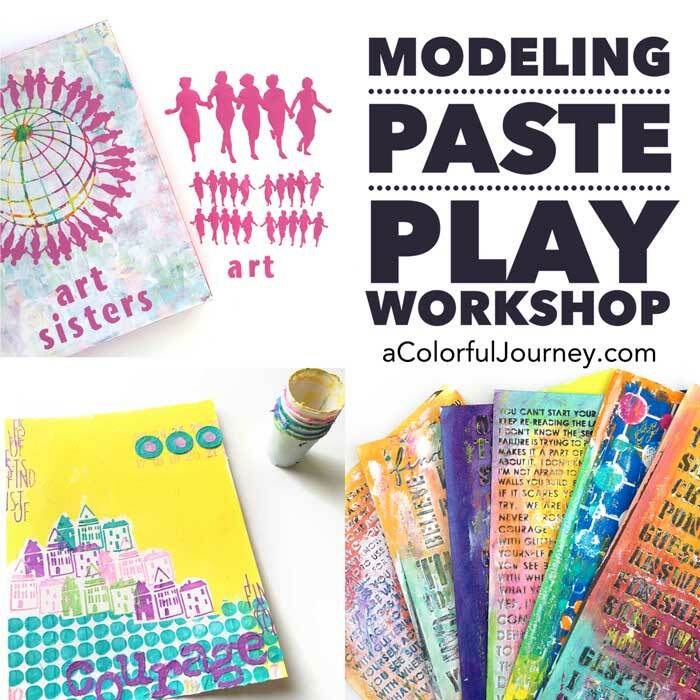 So many fun ways to use stencils. I love it! I can’t wait to get busy on my summer playful canvas shoes. What a fun way to add humor to fun bright colors! Oh my goodness!!! I love these shoes!!! I’ve never thought to use stencils for this kind of DIY project!!! Absolutely stunning!!! My granddaughter is going to love her time with Granny this week! What a great project to share with her and get matching shoes, too! I just got some of those mini presses. Had not thought of using them on those type of surfaces. What fun. I bet my granddaughters would love to help. Thanks so much for your inspirational projects. Now I want to do this!!! Thank you, as always, for getting me into the studio to play. I’m making a pair, too! I can’t wait to try this. Those sneakers are soooooo cool. Love the tennis! This way they can be my design a day unique instead of mass produced. I can have a pair for every outfit! Love how you made these shoes FUN! What fun! This is so effective & not too tricky to try. Thank you for the inspiration. That’s awesome. I painted some shoes for a concert once. I didn’t have good paint so I had to use medium… it was.. eh. Nice to know I can just use acrylic paint without it. This looks like so much fun! You are the queen of play. You always come up with the best art projects!! What a great idea this is and I can’t wait to give it a try! 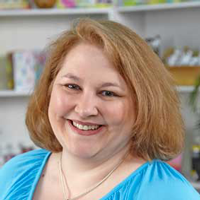 Love your shoes – it’s a great idea and one I will definitely try. What a great idea, Carolyn! It’s a useful piece of art (one of my favorite things) AND a conversation starter. And that stencil is to die for. Cute! That stencil is awesome. Thanks Carolyn! The painted sneakers are absolutely delightful! Thank you for sharing this great video of the process. You could do this on a plain tote bag or other small item too! WOw! could I do the same thing on leather or nubuck or similar? the only shoes i wear anymore are Birkenstock and I saw some sandals in white Birko Flor® which is made of soft acrylic and polyamide felt fibres with a durable smooth leather-like finish.